In the year 1992, the Indian Army opened its doors to women. Women have served in the army for more than 80 years, but mostly in the medical field. It took more than 40 years after Independence to gainfully employ women as officers. In 1992, when the armed forces invited women applicants for 50 vacancies, they received 1,803 applications--this is, 36 applicants per vacancy. In 2005, the number rose to 150 applicants per vacancy. 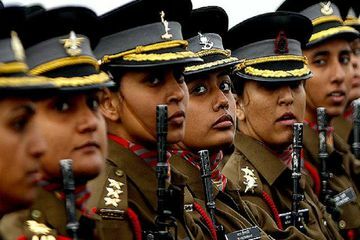 The total strength of women in the forces exceeds 25,000; yet, till 2015, India did not allow women in active combat. In October 2015, the government took its first step towards bringing women into fighting roles, and approved the Air Force’s plans for female pilots to fly warplanes from June 2017 on a three-year experimental basis. When we think of the military, we think men. 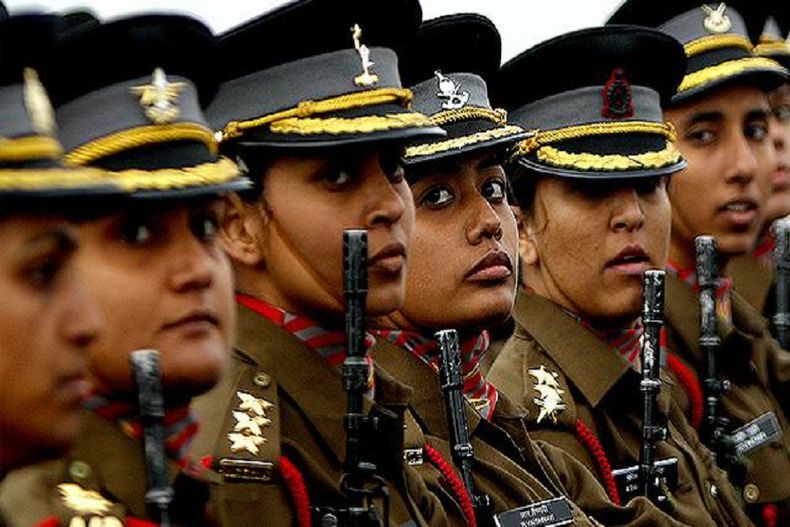 India has one of the largest militaries in the world; yet, women comprise only 5.4%. So what role do women play in the armed forces, and what draws them in large, ever-increasing numbers to this male-dominated world? Women can serve as short service commissioned officers for a period of 10 years, with a maximum extension of four more years. Women fly helicopters and transport aircraft, wield weapons and patrol borders. Apart from these officer duties, women serve in the medical, legal, engineering and teaching departments of the army, navy, air force and coast guard. In 2008, the government decided to grant permanent commission to women in specific departments--mostly desk-based jobs. A very significant role played by women officers is patrolling our borders. There is a steady increase in women officers guarding our borders. The Sashastra Seema Bal (SSB) is the country’s first para-military force to recruit female jawans. Wielding guns, the SSB jawans keep a sharp eye on the 1,750 km open India-Nepal border. This border is open to all--something that terrorists and drug lords often take advantage of. Drugs are often smuggled across by women, making it difficult for the male officers to keep check. Female jawans maintain a day-and-night vigil, checking everything that passes through the border. At the Attari border, there are valiant men patrolling; and with them are equally passionate women ready to take on combat duties. They train with the men and participate in all responsibilities alike. Women are positioned in observation towers along the border, and rotate night patrol duties with their male counterparts. Women are slowly getting more duties and recognition in the armed forces, but it is not easy sailing for them. Several studies have shown that gender biases in current jobs exist, and male officers are not always confident of their female colleagues. What drives these women to leave cushier jobs and easier acceptance and move into a territory where their capabilities are looked at with suspicion? Wing Commander Puja Thakur became the first Indian woman officer to lead a tri-service guard of honour for US President Barack Obama; and although, in the past, female naval and coast guard officers have been known to spend their entire career doing on-shore duties, Assistant Commandant Chouksey, 25, has already started sailing. Lieutenant Ganeve Lalji is set to create history by becoming the first woman to be appointed as a key aide to an Army Commander. The achievements may be few, and most women know that life in the military is not easy. But, driven by patriotism and pride in what they do each day, they endure the challenges and increase in number each year. Women work at par with their male officers; therefore, when the armed forces advertise asking, ‘Do you have it in you?’, they hold their heads up high and reply in the affirmative. With more than 15 successful years in the IT industry behind me, I now work in the mental health field. I’m an avid reader, a counsellor by profession, mother by choice and writer by passion. I enjoy understanding the complex workings of the mind, why we do or say what we do. What makes us the people we are and how imperfectly perfect our thoughts are. This reflects many times in my writings.